Will you walk with us through this is beautiful, native woodland? It’s a time capsule – the way Cayman Brac looked to a settler whose small boat might have run up on the sandy beach at Stake Bay, in the 1830s. WE ARE WALKING FROM NORTH (seaside) TO SOUTH (towards the north-side bluff): bearing 160 degrees. 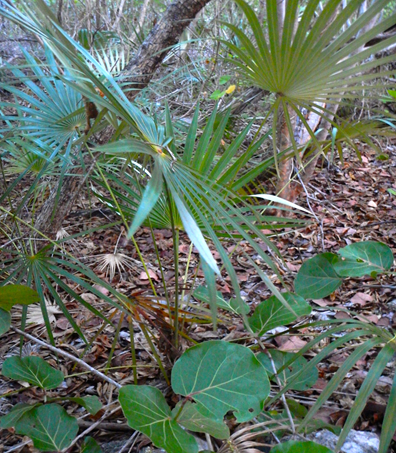 Climbing the rocky “Hurricane Dune” or beach ridge: It is overgrown with Sanseveria (Mother-in-law’s Tongue). Some of the rocky dune was recently gouged out by a machine, leaving an unsightly hole, and it is at this point that we enter the bush. Next comes Sea Grape over a patch of young Silver Thatch. An Antillean Nighthawk sits in the middle of the gravel as we walk, and flies off “reluctantly” in their manner. There was a house nearby at one time; a small, surface “well” remains with part of a tin roof to catch rainwater, perhaps for gardening, drinking and washing. 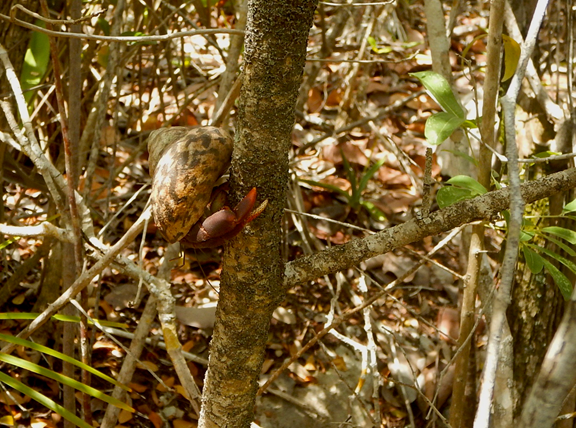 Some drier-land species now appear, such as Pepper Cinnamon, Coco-plum and a young tree that appears to be Indian Almond. Colubrina elliptica is here too. People lived close to the sea for access to their catboats, and planted more imported trees than native species. Proceeding north (we’re bound for the bluff) we walk downhill ever so slightly. “The Fall” is the name traditionally used to describe this dip. Next we enter pure Buttonwood Swamp. This is a remnant of the main feature that defined “the fall” along the whole north side prior to human settlement, beginning in the 1830s. It would still be an east-west feature if it weren’t for the fact that all the land divisions for houses, streets, small farms and so on were oriented north-south. In Stake Bay alone, about ten streets and lanes can be counted, all running N-S, in a single half-mile walk along Front Road. 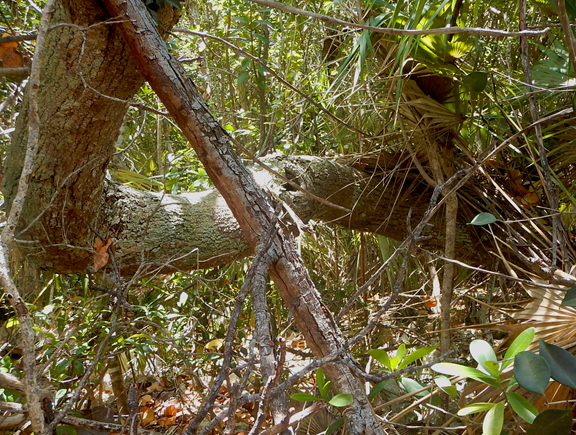 They have caused the swamp to dry up, but many water-tolerant trees such as “Strawberry” remain. It is so quiet in the buttonwood swamp, and so tangled, that one takes one’s time to push through. The rewards are great – they include a shy “Hickatee” or land turtle; a species of anole (our common lizard); the sound of Gray Kingbirds (they are dominant in the lowland at certain times of year); and, first by sound and then by sight, a Green Heron, its legs moving slowly on fallen branches, just inches above the water. There’s another small pond very close by. We have to change our route a little to get around it. Soon we reach more ponds and we veer west to go around them. An Antillean Nighthawk is on the wing. In the leaf mold near the edge of a pond we notice two large land crabs, one quite pale and one bluish-gray and extra large. My friend gauged it to be a foot across, including the legs in their normal placement to the body. 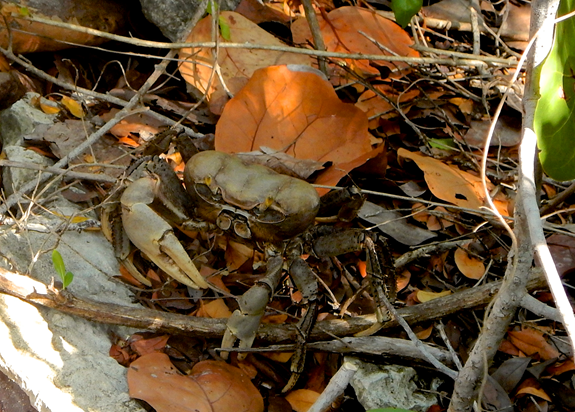 We think this crab is following us as we creep around ponds, but it’s probably our imagination. Still walking south we are forced a bit further west by more water. 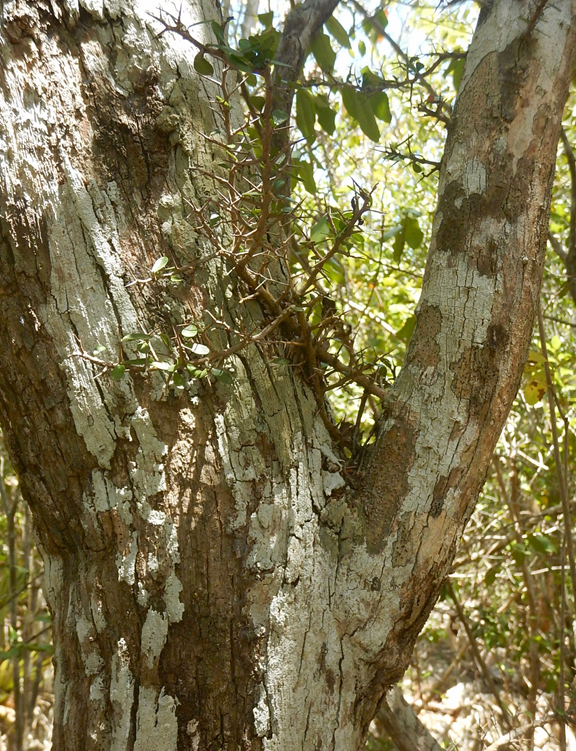 Randia aculeata (Lance Wood) appears, and Jacquinia keyensis (Washwood). Reverting to the “introduced plants” theme we come upon “Brown gal” and the night-blooming jasmine locally called Star-of-Bethlehem. A Green Heron squawks very close to us, and at least one loud parrot flies over. 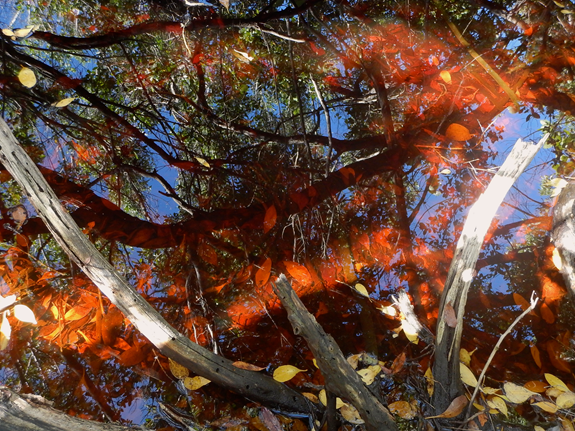 The pond water is very reddish as you can see, possibly tannic from the dead Buttonwood bark all around. The ponds reflect the sky above, including tall, healthy Buttonwood. A beautiful scent surrounds us. At times Buttonwood is the only tree species visible. A small warbler turns out to be a female Northern Parula, which indeed is known to hang out in damp areas. Here’s a photo or two. The first shows the tannic water, the second a crab measuring 12” across. These crabs need protection on the Brac. One of them looks dead but it’s far from dead! Continuing our transect south through the middle of this rich, wild property, more introduced plants are observed including a Naseberry tree and many (too many!) Agave sisalana. This is not our native agave (“Cordo”). A piece of land must have been cleared here and these plants tend to spread extensively. But there’s still lots of Buttonwood. SLIGHT UPWARD SLOPE CONTINUES Proceeding north the land continues its slow rise towards the base of the bluff. The vegetation changes. As the land rises the vegetation changes but there are still many shallow holes, all of which will fill with water during rainy periods. 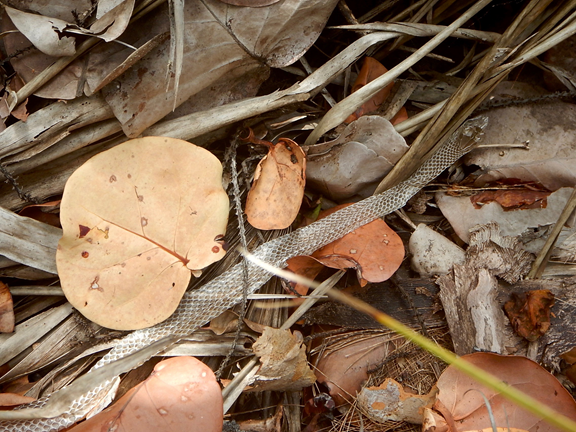 A black racer has shed its skin, and we see a soldier crab climbing a sapling. Trees became more varied. “Strawberry” of course is always common in wet areas, or areas prone to water. Banana orchids, Tillandsia species (“air plants”) and Wild Cocoplum appear, along with a giant specimen of “Shake hand” – we think “horridum”. (Sideroxylon horridum.) 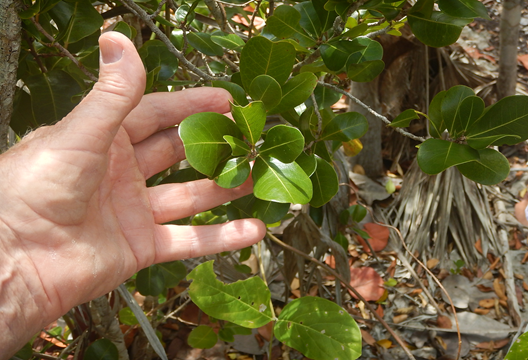 Manchineel makes an appearance as well – a favorite sight as long as you know how to recognize it! 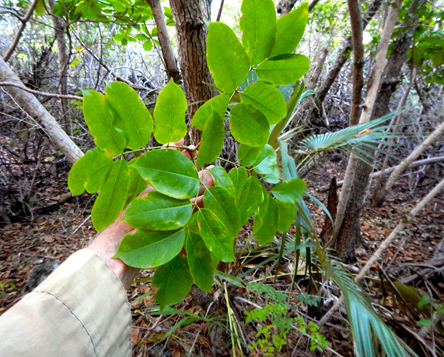 Handsome but toxic: Manchineel – Hippomane manchinella Don’t worry, it won’t chase you. An amusing aspect of our trek is the increasingly “bushy” aspect as we get close to the main road. Invasive plants have taken over because of previous clearing. 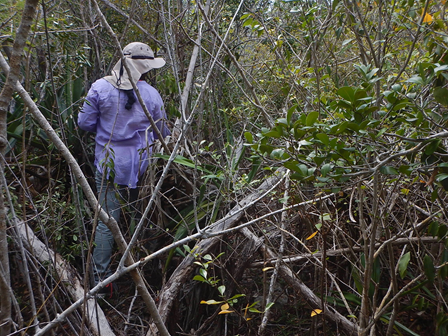 The bush becomes so dense at one point that we have to crawl on all fours, using the hats on our heads to push through. Clearing had given air space for Brown Gal, Break Bone, “Cissus” and other vines and shrubby plants that almost block our way. Gaining the main road we walk east a few paces, then north behind the Kirkconnell Community Care Centre. Here’s an important highlight. The native iguana that is known to KCCC residents and staff paid us some wary interest (we have the photograph) then dashed into “our” bush, the one we had just travelled! This made us feel proud for having checked out his terrain. Save our bush, save our native iguanas! 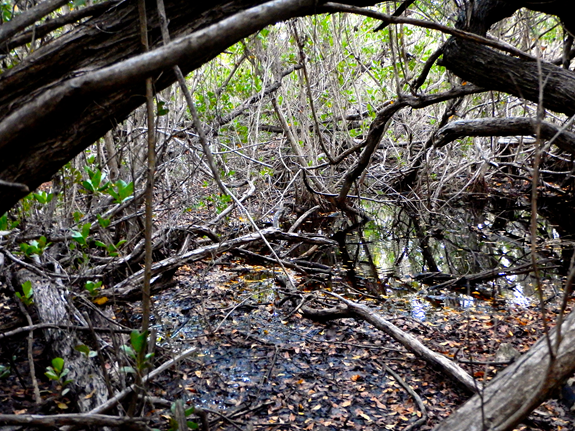 This is our original inheritance, a “vestigial buttonwood wetland” representing the way both coasts of Cayman Brac looked at the time of first settlement. This is the end of the report by three hikers. We plan to suggest a name such as “Stake Bay Urban Wetland”. It is a piece of history awaiting protection. It is rich, varied and preserves a place for nature to hold its sway. It is a hidden treasure right in Stake Bay town.